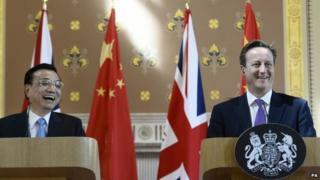 China says it wants to back major UK infrastructure projects and has signed £14bn in trade deals. The news comes on the first full day of a visit by its leader. The BBC understands the projects the state-owned China Development Bank (CDB) wants to invest in include High Speed 2 and the next generation of nuclear power stations. A major deal between BP and China National Offshore Oil Corporation is worth about $20bn (£11.8bn). That will run over 20 years. CDB has signed a memorandum of understanding with TheCityUK. The agreement will encourage CDB lending in the UK as well as trading in China's currency, the renminbi, which will open up trade opportunities in China to British businesses. The memorandum is part of the announcements made by David Cameron and Premier Li Keqiang on Tuesday afternoon on closer Sino-UK commercial relations. The Prime Minister, David Cameron, said: "The UK is the most popular destination in Europe for Chinese investment with more Chinese investment into the United Kingdom in the last eighteen months than the whole of the last thirty years combined." The memorandum has been brokered by Sir Gerry Grimstone, chairman of TheCityUK. The oil giant will supply its Chinese peer with liquefied natural gas (LNG), BP chief executive Bob Dudley said at a conference in Moscow. Mr Dudley said the deal would be signed in London. "It is a 20-year supply agreement on LNG. It is a fair price for them and a fair price for us. It is a good bridge between the UK and China in terms of trade," Mr Dudley said. BP already supplies CNOOC with LNG from Indonesia. Meanwhile, the UK's MAP Environmental and and China's ZN Shine Solar have entered into a joint venture to purchase, develop, and manage £400m of UK solar panel assets. The project will involve a three year construction programme in conjunction with some of the UK's largest engineering and construction contractors. Sir Gerry said that his discussions with CDB on Tuesday morning revealed that they were focused on three specific sectors. "They are interested in nuclear, high speed rail and telecommunications," he said. "High Speed 2 was one of the things they specifically mentioned [in the meeting this morning]. Knowing the finance is available is an important part of any project. This is an important development." Despite the political controversy surrounding the £42.6bn HS2 project, CDB's position will be a welcome boost for supporters of the line. Downing Street has previously insisted the route will be wholly funded by the taxpayer, but a large investor could come in to run the service or to build stations and ancillary connecting services. The first part of the 250mph line to Birmingham is due to open in 2026. Premier Li offered direct help to build HS2 during Mr Cameron's visit to China last December. That offer, which came as surprise to Number 10, was quickly followed by China Railway Group, a subsidiary of the state owned China Railway Engineering Corporation, saying that it could also help with construction projects connected to HS2. "HS2 could be an attractive investment opportunity," said Sir Gerry, who is also the chairman of pension provider, Standard Life. "This is not some wishy-washy diplomatic gesture." CDB is one of the biggest players in infrastructure development loans worldwide and is seen as an arm of Beijing's economic development policy as well as an extension of the country's "soft power" around the globe. Sir Gerry describes it as the "trillion-dollar bank" and it spends billions of pounds every year supporting projects, particularly across Asia and Africa. CDB is now looking to extend its influence, and that of China, into Europe. They are not alone. The Bank of China also announced a memorandum of understanding with the London Stock Exchange on Tuesday to increase its presence in the City. On Wednesday, another state-backed giant, China Construction Bank, is expected to be confirmed as the first Chinese clearing bank designated for offshore renminbi trading in London - a shot in the arm for the City's aspirations to be the major centre outside Hong Kong for dealing in the currency.